You can avoid reaching for the mouse if you are familiar with keyboard shortcuts. If you forget one of these, use the mouse and go to the menu bar. In each pull down menu you will see keyboard commands given in the right side of the window. Open a new word document quickly. Cut- Removes the selection from the active document and places it on the clipboard. Opens a previously saved document. Closes the active window, but does not Exit Word. Paste - Inserts the contents of the clipboard at the insertion point (cursor) or whatever is selected. Saves the active document with its current file name, location and format. Selects all text and graphics in the active window. Exit - Closes Microsoft Word. Undo the last action. This selection can be repeated several times. Redo - After an action has been undone, it can be reinstated in the document. This list is by no means complete. 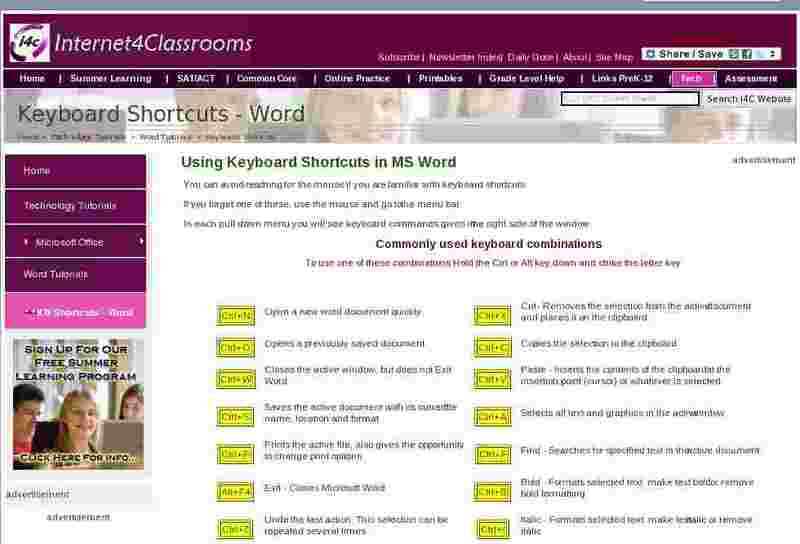 To find other keyboard combinations check the Word help index. Leave your browser window open. Open Microsoft Word, if it is not already open. 1. Open a new Word document and type a line of text. If you wish to do so you could copy this line and paste it into the document. Each of the steps in the list above should have been accomplished without the use of your mouse. If you reached for the rodent, review the two tables above, go back to step 1 and try again. Good luck. Exhaustive list of shortcuts in the form of a word document. Exhaustive list of shortcuts in the form of an excel document.